COUNTRIES OF ORIGIN: Ancestral stock from Italy developed into a standard breed in England. The breed takes its name from the port city of Ancona on the east coast of Italy, where the ancestors of the eventual standard breed originated. These were of fairly uniform type and size, but of varied plumage colours and patterns, many, but not all, with white markings of some kind. John Taylor, from the Shepherd’s Bush area of London, was the first recorded English importer in about 1850, and it was he who set the idea of Anconas being a black breed with white spots. However, the markings remained irregular until refined by later breeders, notably Mr Geffcken of Southampton in the 1880s, and Mrs Bourley, from a village near Birmingham, in the 1890s. Only then were they generally considered uniform enough to be ‘a proper breed’, and exported around the world from the UK. 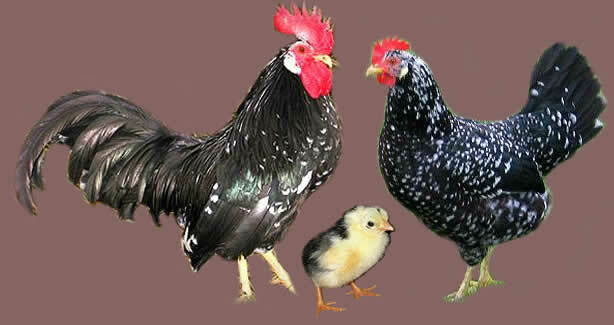 They are excellent egg layers, and obviously related to the Leghorn breed, which share a similar history. Leghorns were exported from the west coast port city of Livorno and developed into a standard breed in the USA.